Entrepreneur, author, and columnist Tonia DeCosimo pours out her heart in her new book Single & Not Settling! : A Journey of Surviving the Dating World. This memoir and self-help book gives readers a look into the life of being a single forty-something searching for love in the 21st century. DeCosimo has experienced both serious heartache and blissful love, which motivated her to write her book for other women. Her memoir will speak to those who have been searching for love and to those who thought they found it but had to let it go. DeCosimo draws from experiences she has gone through and incorporates her professional background as a bi-weekly love advice columnist for The Date Mix, the web magazine hosted by Zoosk.com, one of the largest dating sites in the United States. Single & Not Settling! : A Journey of Surviving the Dating World is a wonderful summer read this year. What makes the personal stories you chose to highlight in your book relatable to other women? After talking with friends and interviewing multiple women, and even some men, who are single in the 21st century, common threads developed. They all felt that finding the right person has become very difficult and the ways to date have become very complicated (especially for those of us who are over the age of 40). Even though everyone’s story is unique, I found many similarities to what I experienced in my dating journey. The particular details of my stories, however, are different which allows the reader to discover new hilarious and bad dating stories while still being able to relate to them. It also allows them to keep the faith and realize that there is a light at the end of the tunnel. Which relationship do you discuss in your book that you feel taught you your biggest lesson? What was that lesson? My high school first love, that I was with for 9 years, taught me the biggest lesson. Even though you think you really know someone, trust them and are planning on marrying them, you may not know them at all! When he asked me to marry him and wanted me to pick out the ring, that very same day I found out that he was cheating on me. I was 23 years old, devastated, and realized from that point on, trust became something I could not take lightly and had to be earned. When we say we trust someone, do we really? And how do you know who you could ever trust? From then on, I learned to listen to my gut intuition, keep my eyes wide open, and be realistic when it comes to relationships. What do you say to women who just cannot find “the one” to settle down with like you did? No one ever knows who, when, or where they are going to meet “the one.” Some people’s lives follow their plan, while others take many turns and follow other paths. Keep an open mind, be realistic, and go about your life — while still making an effort to meet new people. Keep the faith and whatever is meant to be will be. No partner is perfect, so how should a woman decide whether she is settling or just compromising? Settling is basically giving up and giving in, even though your needs are not being met. Compromising is meeting in the middle and understanding that not everything is going to go your way. When two people are in love, compromise is an everyday occurrence which for the most part, occurs naturally. Settling would be compromising your true self. What are the top 3 deal breakers in a relationship? Is there ever a time a woman should adjust her deal-breakers when in a long-term committed relationship? For the most part, deal breakers are different for everyone. There are certain ones, however, that are universal. The top three, in my opinion, are verbal and physical abuse, addiction, and chronic cheating. These three deal breakers should never be adjusted. While people have worked through a one-time affair, numerous affairs should never be tolerated. Only you can decide if one of your personal deal breakers is negotiable, given the circumstances of your current long-term relationship. What do you hope women will do after they read your book? I want women to take a realistic look at themselves and their relationship history. Look for patterns that have not been working and try and learn from your past experiences. Understand that no one is perfect, and you can’t always judge a book by its cover. However, listen to your gut feelings and don’t try to fight it. You should never have to settle, but sometimes you have to compromise. We are all on a journey and what makes your journey unique is by you staying true to yourself. If there was only one piece of advice you could give about relationships and dating, what would it be? There is so much advice that I can give, as outlined in my book, “Single and Not Settling,” but for me, the key is to not fight your own intuition. That gut feeling is God-given, and fighting it will always lead to disaster. You can purchase Single & Not Settling! 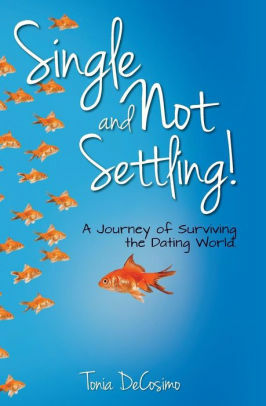 : A Journey of Surviving the Dating World on Amazon.com and at Barnes and Nobles. For more information on Tonia DeCosimo, check out her website.